Plenty of children experience difficulty in finding books they enjoy reading. Many others will fix upon one genre, one author or one series, reading avidly from that collection of titles but rarely branching out and trying new sorts of books. So, as a parent, how can you encourage your child to read more widely? Here are a few quick tips. Most children, even those who don’t think of themselves as keen readers, in fact read for hours a week online. You can tap into the crossover between reading online and the world of novels and non-fiction books. There are plenty of blogs and websites dedicated to children’s fiction, featuring reviews, snippets, author interviews and videos. These online resources help to bring books alive, making them immediate and relevant for children as they surf the internet. Try introducing your child to a few blogs and sites, in an effort to ignite their passion for reading books. If your child is hooked on science fiction or won’t read anything unless it’s by Jacqueline Wilson, you can encourage them to pick up different books by thinking about their interests. If your child enjoys horse riding, for example, and is hooked on a series of books set in and around a stable, perhaps they might like to try a novel like War Horse by Michael Morpurgo. In giving this book a go, they will be introduced to historical fiction. Unabridged audiobooks can be a great way to give children a thirst for stories. Non-fiction audiobooks can also be purchased. Children can transfer CD audiobooks to an mp3 device or simply download an audiobook online. Plenty of children regularly read non-fiction but rarely try fiction, whilst many others are firm fans of novels and rarely pick up a factual volume. Again, this problem can be solved by keeping your child’s interests in mind. So, if your child loves reading science fiction novels, why not encourage them to pick up a book about rockets or astronauts? Similarly, if your son or daughter is keen on geography books, buy or loan them a novel set in an exotic location. In focusing on your child’s existing interests, trying something new will be less daunting for them. Favourite films can inspire kids to read. Whether that means picking up the ‘book of the film’ or trying a classic or popular novel that has been adapted for the big screen, reading about familiar characters can be a real boost for children's reading confidence. 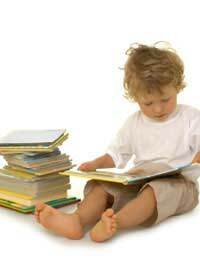 If your child struggles to stay focused when reading alone, consider reading with your child. That might mean you reading to them, them reading aloud as you listen or even just the two of you sitting side by side with your own books. To make it as easy as possible for your child to get reading, leave books, magazines and other reading material around the house. Five minutes spent flicking through a book at the breakfast table can mean real progress for some young readers. Not only is there a book for everyone, there are plenty of books for everyone. Help your child to discover the joys of reading today.